It is with much sadness we acknowledge the passing of our wonderful lady LOCHIE (Aust Ch Sandimorn Toohot Thandle). Lochie left us on Saturday the 19th of May 2007 at the age of 14. 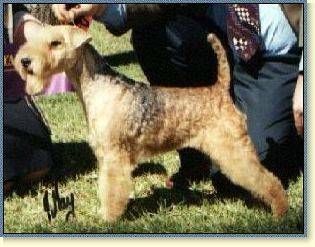 She was a great ambassador for the Lakeland breed, having that wicked temperment yet at the same time the most loyal friend one could have. She has certainly left a great legacy at Sandimorn being the Granddam and Great Granddam of the Sandimorn Lakelands of today. She will be sadly missed by all that knew her especially Troy and myself. Rest in Peace wonderful lady, we miss you.